Asked by the federal government this week to issue a recall on more than 2.7 million Jeeps after an investigation showed that rear end crashes led to at least 51 fiery deaths, the Chrysler Group had this to say in response: "Thanks, but no thanks." How does that work? NHTSA officials claim rear-impact crashes and subsequent fires have caused 44 deaths in Grand Cherokees, seven deaths in Libertys, and 28 other fires in both models that thankfully did not result in deaths. "When will the killing end, when will 4-year olds stop being burned to death in Jeep Grand Cherokees?" Ditlow said. There, Ditlow is referring to the death of 4-year-old Remington Walden, who burned to death last year after a Grand Cherokee he was riding in was struck from behind in Georgia. Ditlow estimated that recalling nearly 3 million Jeeps could cost Chrysler about $300 million. With off-road design comes compromise. Chrysler's most recent gas tank woes demonstrate this point clearly, as the gas tank location of the Grand Cherokee and Liberty were designed to keep Jeep's off-road credentials intact. There are quite a few reasons why Chrysler put the tank behind the rear axle. First, it's easier from a packaging standpoint. While some vehicles mount their gas tanks along the axis of the vehicle on either side of the driveshaft, the Grand Cherokee and Liberty contain quite a bit of off-road hardware between the axles (transfer-cases, driveshafts, center differentials, etc.). Moving the tank outboard (near the rockers), would make the tank particularly vulnerable during off-roading. They could have used a saddle-type tank, but that may not have fit either, and if it had fit, it would be more costly and would likely make vehicle assembly more difficult. The Grand Cherokee's cargo floor sits high off the ground, leaving room to put the tank aft of the rear axle while maintaining sufficient ground clearance. Once again, it's an off-road vehicle, so keeping the rear overhang small was important to off-road enthusiasts. As such, there's not much space between the rear bumper and the plastic tank (less than 12 inches). NHTSA looked into accidents involving rear impacts and fuel leaks, and also began investigating Chrysler's self-certification tests for Federal Motor Vehicle Safety Standard (FMVSS) 301: Fuel System Integrity. Basically, NHTSA looked into accident cases and Chrysler's own safety testing to see if Chrysler's design presented an unreasonable risk to drivers. What they found was that the Grand Cherokee was involved in 1 fatal rear-end accident per million registered vehicle years (MRVY: the number of registered vehicles times years registered) and the Liberty was involved in 0.9 fatal rear-end accidents per MRVY. How did the Jeeps' peers fare? They averaged 0.5 fatal rear-end incidents per MRVY. The major concern is that, because the Jeeps are so high off the ground, and because there is so little rear overhang, it is possible for small vehicles to directly impact the rear gas tank. This direct impact can lead to fuel leakage and a consequent fire. On Monday, NHTSA sent Chrysler a letter requesting a recall. But Chrysler has refused the request. That's rare, but it can and does happen from time to time. The last time it did was in 2011, when Ford declined to recall 1.3 million F-150s for an airbag problem, although they eventually caved and issued the recall. "The subject vehicles are safe and are not defective," Chrysler said in a statement issued Tuesday. "We believe NHTSA's initial conclusions are based on an incomplete analysis of the underlying data, and we are committed to continue working with the agency to resolve this disagreement." So that's what Chrysler considers this issue: a "disagreement" between them and the government. Jeep also redesigned the Grand Cherokee in 2005 and moved the fuel tank in front of the axle, which has prevented further fires. As Edmunds notes, recalls happen in one of two ways: a manufacturer can initiate one on their own, or NHTSA can request one. Nearly all are "voluntary" recalls, initiated by the manufacturer, but some are prompted by the government, and they begin with consumers submitting complaints. Over the last three years, all but three of Chrysler's 52 recalls were self-initiated. Once NHTSA has determined the need for a car recall, federal law requires manufacturers to notify all registered owners and purchasers of the affected vehicles by registered mail. The notice must explain the potential safety hazards presented by the problem and instruct consumers on how to get the problem corrected. It also must inform consumers that the repairs are to be made at no charge and tell them when the fix will be available, how long it will take to perform and who to contact if there is a problem in obtaining the free recall work. It's important to note that a recall request is just that: a request. The government lacks the power to order a manufacturer to recall and fix their products. If Chrysler still does not acquiesce to the request, NHTSA can hold public hearings in which they declare the Jeeps to be defective and then secure a court order that enforces a recall. And as Justin Hyde says, that opens them up to potentially more lawsuits, not to mention a ton of bad press. And how can Chrysler fix this problem? Relocating the tank is not really an option. That would require re-packaging the entire drivetrain. Changing gas tank material? That would be very costly. They could also decrease tank size, thus moving the rear of the tank farther from the rear bumper. A more realistic option would be to fit the vehicles with thick gas tank skid plates. These would ensure that, in the event of a rear end collision, there is no direct contact between the front of a vehicle and the Jeep's gas tank. Chrysler maintains that its vehicles met Federal Motor Vehicle Safety Standard 301. NHTSA says that's fine, but FMVSS 301 is a minimum standard, and that they'll recall any vehicle that poses an unreasonable safety risk to consumers. So why doesn't Chrysler just do the recall, if only to save face? Cost is one issue. With the recall estimated to cost $300 million, that's awfully pricey at a time when Fiat-owned Chrysler is finally just starting to become profitable yet again. It could also reflect the defiant attitude of CEO Marchionne, who's a well-known maverick. But as Automotive News' Larry Vellequette says, Chrysler says the Jeeps exceeded government safety standards for fuel tank design when they were built, and that asking them to change that is tantamount to requesting a retrofit to meet modern standards. 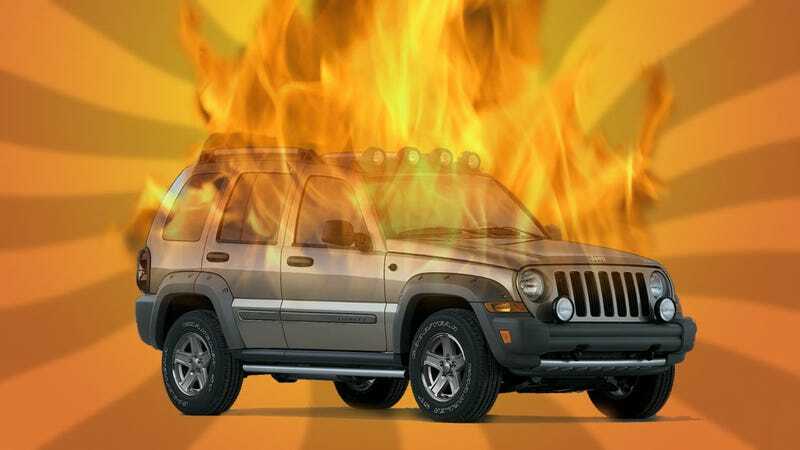 In addition, Chrysler may feel singled out, as their study of the NHTSA database "shows the Jeeps are less likely to be involved in a fire than several other comparable vehicles from the same period that aren't under investigation." Still, I'm in agreement with Vellequette on this one: the right thing to do here is bite the bullet and issue the recall. Even if the Jeep isn't truly at fault, a recall will assuage the public's concerns a bit and probably make the whole thing go away. At the end of the day, millions of Jeep owners don't care about whether Chrysler is right or wrong — they care about their personal safety, and they're freaked out when they see "FIERY CHILDREN DEATH" on the evening news. Wouldn't you be? By ignoring a recall request, Chrysler is asking for bad public relations and for this to be blown up into a big, negative, national story at a time when they really don't need it. The bailouts are still fresh on everyone's minds, and while Chrysler has improved dramatically since Fiat took ownership, they still have a long way to go in many regards. It's a risky gambit on Chrysler's part. We'll have to see if it pays off for them.